Soil Stabilization of Oklahoma, Inc.
What should I know before buying a home in Oklahoma? An extremely large number of Oklahomans have purchased or built homes that were constructed with foundations that were not designed to handle the clay soils prevalent in so many areas of the state. Unfortunately many municipal code authorities do not have residential standards that adequately address these soil characteristics. As a result, it places the burden of foundation adequacy on the home owner. A home buyer can be easily fooled into thinking a home has no foundation movement problems prior to purchase because the prospective home can many times be cosmeticly "dressed up" to hide movement problems. Once the home is purchased however problems show up with cracked sheetrock, doors and windows that stick, and other anoying problems. To prove the magnitude of this problem merely consult the number of foundation repair companies active in a given region of the state. It can easily be proven that most, if not all, of the foundation problems that they repair have been caused by expansive clay soils. 2. Carefully check the exterior of the home surfaces for patches to brick mortar or other rigid surface repairs. 3. Check the driveways and sidewalks for cracking and other vertical movement. 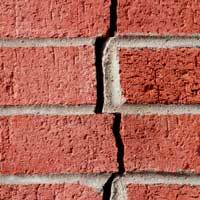 If they exhibit cracks where surfaces are uneaven or larger than the normal hairline cracks, there will most likely be foundation problems within the home. 4. If all of this is too confusing, contact us. Our company can provide guidance, second opinions, or inspections of the site anywhere in Oklahoma at a very nominal cost. What is different about our method of stabilizing foundations? Most homes in Oklahoma suffer from foundation movement many years after the home or building is complete. Foundation movement after several years is usually not caused by soil collapse. It is the industry experience that expansive clay soils beneath the home or building are responsible for this. Our process cures the problem by curing the soil. We do not just merely prop the structure up on unstable soil that will simply move again. Do I have too much clay in my soil? There is an easy way to find out if your home is moving from the clay in the soil around your home. You can dig down several feet and see if the clay feels like clay. You know, you can knead it when it is damp and you can roll it into long "sausages" or "snakes" as you did when you were young. If the surface of your soil cracks when dry, like the photo on the left, you have clay. Of course, you really don't know how bad it is without some other information. You can consult us and we can find out how much clay is in your soil without even visiting your home. There is a very small charge for this service of $10 to cover mailing the information to you. You can also possibly find the area of your home on one of our maps below. If the expansion of the clay soil is zero percent then you do not have to worry about the clay moving your home. If it is above 1% then some minor movement may be expected. Of course it is in the 6-9% range as many parts of the Tulsa area are, you can expect very significant movement and damage. The City of Tulsa is aware of this problem and has documented the issue in their "Multi-Hazard Mitigation Plan". Is it more expensive than other methods used by other companies? No. In fact it is usually many times more economical than other methods. For typical prices CLICK HERE. Is this the same as what other companies use to stabilize soil? Different soils require different treatment methods to make them stable to build upon. For instance some weak soils may need to be treated with products that actually bind or cement the weak soil together. Other soils such as clay soils have plenty of strength and good building properties as long as the moisture in the clay remains in a certain range. Unfortunately, clay cannot always be kept in a stable moisture range. We treat the clay so that moisture has little effect on either the expansiveness of the clay or the strength of the clay. Don't be fooled by other products that have not been on the market for over 40-years like Condor SS. Is there a warranty for your foundation stabilization? Yes there is. Most foundation repair companies provide a 10-year warranty of the product and workmanship. We also provide a similar warranty but can also offer a limited lifetime warranty. One thing should be understood however about the product we use, Condor SS. Once Condor SS has changed the properties of the clay soil, it is permanent. Our warranty could be unlimited were it not for other things that can cause foundation problems. Some of the other problems outside our control would include settlement or undermining of the foundation due to sink holes, earthquakes, significant leaks in water and sewer lines, and roof downspouts that dump large amounts of water next to a foundation. Thus our warranty excludes coverage for such unpredictable events. If you would like to read our warranty, CLICK HERE. Will the Condor SS injection process move my foundation or slab back to its original location? Most likely it will not completely restore it. Unfortunately the clay soil will not move back to its original shape. For example, once a foundation stem wall has moved horizontally due to drying and shrinkage of the clay outside the stem wall, the rain wetted clay outside of the stem wall is confined in every direction except for the top of the soil. This causes the clay to mostly expand upward and not horizontally. The clay will therefore not exert the same horizontal pressure to move the stem wall back into place. As multiple wet-dry cycles are experienced, you may see the process slowly moving the stem wall outward over time. You will undoubtedly over time see damage similar to that shown in the this photo. As part of our injection process we will be injecting a considerable amount of water into the soil. Although the amount of water is fairly insignificant compared to the volume of soi. 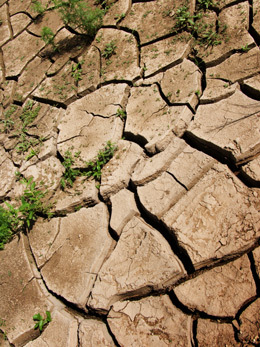 If we are injecting into clay soil that has shrunk due to drying out, then the clay may expand slightly. If however we are injecting into extremely wet or saturated clay soil, the process will actually drive out excess water and cause the clay to shrink and consolidate. Volume wise, Condor SS essentially makes the clay occupy the same space it would occupy if it had been brought to what geotechnical engineers refer to as "optimum moisture content" and fully compacted. Will I still have to have piers or other underpinning? There is no better permanent foundation for a building or home than that which nature provides. It is only because of weak or unstable soils that engineers have to use piers, piling, or other methods to support a building. The clay soil will have very stable and predictable building characteristics once treated. Thus piers will not be necessary unless the soil is being affected by subsurface water, high water tables, slope instability, or some other structural weakness. I have already had piers installed on my building. Why did this not work? See our discussion on pier failure modes in clay soil by CLICKING HERE. My home or building was fine for the first 10+ years. Why is it moving now? If you are in an older building or home that is now experiencing problems and if it is cause by the presence clay soil, it is most likely because the moisture under your building remained reasonably stable. That is because there was nothing to significantly dry out the perimeter of the building. When a home is first built most individuals begin landscaping the area with small trees and bushes and vegetation needs water. Unfortunately, the larger the vegetation becomes the more leaf structure it will have and the more water it will loose through transpiration. The greater the leaf canopy the more water will be consumed from the earth. Clay soil has a characteristic of high suction pressure that will cause the moisture under the building to move from under the building to the dry areas outside the building to replenish the lost moisture. So, even without drought conditions, a building with mature large trees around it, will be gradually building up a moisture deficit under its foundation. This will cause the foundation to gradually sink or more rapidly sink during an extreme drought condition. Will watering the perimeter of the foundation solve the clay problem? It will, if you can precisely control the amount of moisture in the soil. We have found by direct experience to be quite impractical however. The same findings are contained in a 1976 report for the U.S. Dept. of Housing and Urban Developement performed by the Univ. of Texas. Hand watering is a hit-and-miss approach. Automatic sprinklers and subsurface watering systems will not have an economical life or be reliable enough to keep the moisture in a close range. If you cannot treat the clay soil however, you must do the best you can. Keep in mind that the clay soil under your foundation will be pushing in all directions with pressures that can go as high as 4,000 to 8,000 pounds-per-square-foot. If the clay soil even partially dries out on the outside surface of the foundation, the clay will shrink away from the outside foundation wall leaving an air gap. Once the air gap appears, there will be no soil outside of the foundation pushing back against the internal soil pressures of 4,000-9,000 psf. Guess what happens then? The foundation wall will be pushed outward causing exterior walls to move with the foundation. Cracks will then appear in exterior and interior surfaces. These same pressure forces are encountered in retaining walls that have backfill behind them that contains a considerable amount of clay material. The retaining wall can be bowed out and even fail without structural tie-backs into the soil or other means to retain these pressures. Of course, retaining walls will also benefit from treatment with Condor SS. For additional information CLICK HERE. Will Condor SS stabilize any soil? No. Soils other than clay do not have a surplus electrical charge, Condor SS will have no effect on the other soil particles. The Condor SS will simply bypass sandy and gravelly soils and attach to the clay particles. Soils that cannot be adequately compacted, such as organic or peat based soils, will not be improved. How long do I have to wait to notice the effects of Condor SS? If we have treated a pad-site prior to construction, work can begin as soon as the excess water dissipates from the surface and a workable surface for construction machinery exists. Condor SS begins working immediately. The ultimate "Condor Effect" however occurs over time and will improve over several wet-dry cycles becoming more and more stable as time goes on. (See graph of swell (right) that depicts this effect on clay soil over several wet-dry cycles.) Thus by the end of the construction, Condor SS will have achieved its ultimate effects in the soil. For an existing building, we monitor the movement of the building to ensure that at the end of 6-months the building or home is not still moving. Once the movement has been verified to have ceased, final repairs to the home or building can be made and a warranty provided to the owner.